Pictured left to right are Coach Brunzic, Jacob Taylor, Mason Foley, Brandon Campbell, Coach Legendre, Ben Sloan, and Ryan Blaylock. 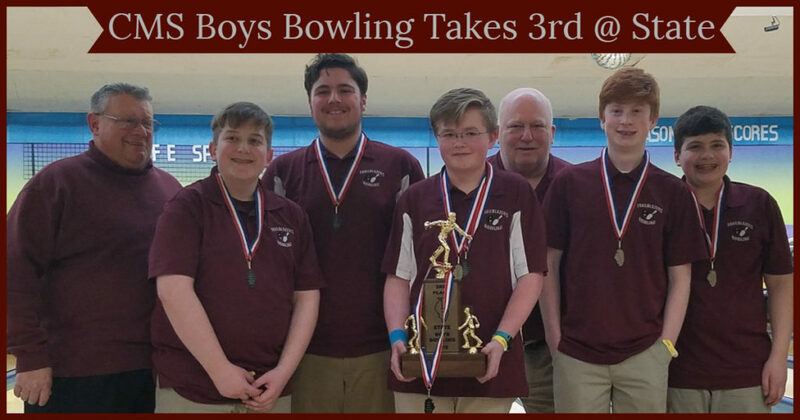 The 2019 Collinsville Middle School Boys and Girls Bowling teams had great outings at the SIJHSAA tournament on Saturday, March 16, 2019 at St. Clair Bowl in Fairview Heights, IL. The Boys Bowling team brought home the 3rd place trophy and Girls Bowling finished 10th. In individual competition, Brandon Campbell placed 2nd out of roughly 200 bowlers. He shot a 1261 for 6 games averaging 210 and finishing just 1 pin out of 1st place. Jacob Taylor finished 16th for the boys and Gabby Prenzel finished 19th for the girls.